“I think a little mouse has been in my cupboard!”, Mother would say mischievously. Of course I knew exactly who the ‘mouse’ or ‘mice’ were that had been sampling the baking supplies in the kitchen cupboard near the old sink. I was the ‘main’ mouse, and loved to sneak a little taste of the walnuts, coconut and cherries that Mother stored for her Christmas baking. My brother Roger was the other mouse in the house. He would sneak handfuls of chocolate chips from her baking cupboard after school, and scurry away into the living room. Luckily, on those days, so long ago, there were still enough ingredients so Mother could add yet another type of cookie onto her list. Stacks of cookies and squares had been accumulating in the old chest freezer over the past couple of weeks. She was knee-deep into her Christmas baking, and as the weeks flew by, there was an ever-growing supply of shortbread, sugar cookies, chocolate chews, date squares, fudge, and toffee piling up in preparation for the big day. One of my favourite types of cookies Mother made, and tucked away in the freezer for Christmas, were the peanut butter balls. Once thawed, they were as sweet and tasty as the day they were made. They don’t require a lot of fancy ingredients, and they look festive and elegant on any Christmas dessert plate. Make them now, and stash them in your freezer! Hopefully, the ‘mice’ in your house will leave a few for Christmas! 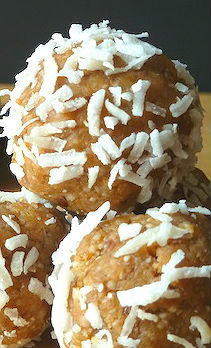 Mix together the peanut butter, nuts, rice crispies, butter and vanilla, and roll into balls. For variety, Peanut Butter Balls may be dipped in melted chocolate, mixed with sprinkles, M & Ms, or decorated with bits of pretzels and candies for a festive holiday look! Enjoy this traditional Christmas treat now, or freeze for the holidays! What would a Christmas sweets plate be without some melt-in-your-mouth homemade Shortbread Cookies! Mix dry ingredients. Blend-in butter, until soft dough is formed. Chill for 1/2 hour. Shape into balls 1 inch in diameter. Flatten with fork. Decorate with cherry slices. Bake in slow oven at 300 degrees F, for 20 – 25 minutes, until light golden. Be sure to leave some Christmas cookies for Santa! Who was the lady behind all of those melt-in-your-mouth Christmas cookies? Audry Stafford competed in local fairs in Lanark County for many decades, and won so many prizes in the baking divisions that eventually she was asked to become a Judge. In the years that followed she judged baking at fairs, large and small, across the county, and throughout Eastern Ontario. photo: Audry Stafford with Tib Stafford, in their farmhouse kitchen, on his birthday, July 15, 1990, Third Line, Bathurst Township, Lanark County, Ontario. 93 of Audry’s prize-winning recipes are assembled in a book “Recipes and Recollections”, along with stories from her five children, about growing up in rural Eastern Ontario, spanning the years from the 1940s through to the 1980s. This entry was posted in Short Stories and tagged Arlene Stafford-Wilson, Audry Stafford Lanark County Fair Judge, Bathurst Township baking, Blackwood Originals, Christmas baking country style, christmas baking ontario history, history of christmas baking in canada, Homemade Christmas cookies, Lanark County traditional baking, Prize winning cook book, prize winning cookie recipes, Recipes and Recollections, Recipes and Recollections Treats and Tales from our Mother's Kitchen, The Book Nook, The Bookworm, the perth fair, traditional christmas baking canada 1950s 1960s 1970s.